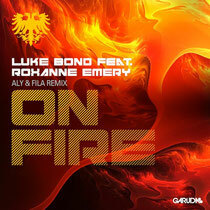 Egyptian trance DJ/producers, Aly & Fila, have put their signature uplifting spin on Luke Bond's January track, 'On Fire'. Bumping Roxanne Emery's yearning vocals and Luke's progressive beats up to a faster BPM and adding a rush of soaring trance riffs and happy melodies, Aly & Fila have taken the already emotionally-charged song to another level. Debuted at ASOT650 Utrecht during Aly & Fila's back-to-back set with John O'Callaghan, voted "Future Favorite" on A State Of Trance #653 and since added to Sirius XM's rotation, the remix earned many rave reviews from clobbers around the world with its dancefloor appeal and sing-a-long vibes. Out 12 April 12 on Gareth Emery’s Garuda Music, the track will continue to do well with those who like their BPMs faster and euphoric. Check it out below.